Discussions Magazine Music Blog: JUSTIN HAYWARD/Moving Mountains (reissue) reviewed! 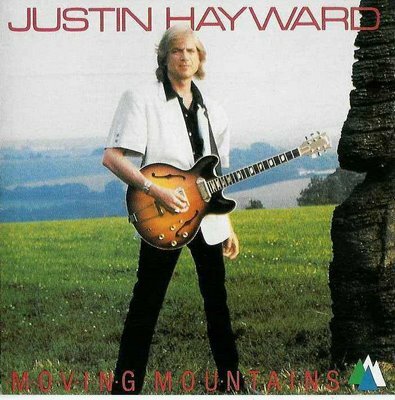 MOVING MOUNTAINS (1985) was his third ‘solo’ album (fourth if you count the BLUE JAYS project with fellow Moodies member John Lodge) and features a fine batch of Hayward tunes that recall his past, present and future. The album, released a year before The Moody Blues made their big commercial comeback with THE OTHER SIDE OF LIFE, definitely sounds like the same work of the man who penned so many fab tunes in the ‘60s and ‘70s yet the production is rooted firmly in the ‘80s. Not as wonderfully bombastic as the Moodies’ albums of the era, the album doesn’t sound far off from what Chris Rea and other like-minded artists were attempting to do at the time – write great songs and present them in a way that would appeal to a larger audience. Some have written that MOVING MOUNTAINS sounds dated. In all actuality, the album is not as slick as some of the albums released in 1985. More importantly, the album’s production never interferes with the excellent songs on display. The majestic “Silverbird” was co-written by Jeff Wayne, who some might remember as the man responsible for “Forever Autumn,” the Hayward-sung hit from WAR OF THE WORLDS. “One Again” stands as a fine album opener. “Moving Mountains” is a wonderful tune. “Lost And Found” possesses a lovely melody and a great vocal from Hayward. (Have I already said that this guy is one of Rock’s finest vocalists?) “Is It Just A Game” is cut from the same cloth as “Your Wildest Dreams” and “The Voice”. Etc. Overall, the album is relaxed and uncluttered. Anyone wanting to hear the Moodies should buy a Moodies album. However, if you want to experience Justin’s singular musical vision, MOVING MOUNTAINS is just one of many places to start. MOVING MOUNTAINS has long been out of print on CD and has changed hands for top dollar on the interwebs. Thankfully, Gonzo has reissued the CD and it is now currently available at a very affordable price. So, why haven’t you ordered it already? You can read my 2016 interview with Justin here!